Pros: Convenient assemblage. Genuine B&S air and oil filters. A bargain when OEM items are priced individually. Fits a variety of one-cylinder Intek engines. Cons: Included 48-oz. oil jug not sufficient for my 18 HP engine’s crankcase capacity. While wandering through my Sears Hometown store, I was drawn to the discount aisle to test my intermittent bargain karma. I admit… it’s actually a major reason why I stop-in every other week. In the past few years, some great and useful stuff has found its way into my cart – everything from tool sets to power-washers to appliances may appear for price-slashed consideration by whim of the local store management. On one autumnal occasion, my off-season mission was to find an air filter replacement for my Briggs & Stratton-powered Craftsman lawn tractor. The two-stage filter consists of a plastic foam pre-cleaner and an accordion-style paper air filter element. The good news was that they stocked the item. The bad news was the $36.99 price tag (all prices US) – and I hadn’t yet located an oil filter or set of replacement blades. To my good fortune, this week’s bargain-aisle included the Craftsman Briggs & Stratton 14-19 Horsepower Intek Tune-Up Kit. The 9x10x5 inch box contained the aforementioned air filter, plus an oil filter, spark plug and a 48-fluid-ounce jug of SAE 30, 4-cycle engine oil. The list-price for each kit is $42.00, but due to seasonal considerations, they were out-the-door at $20.00 each. Under those conditions, what smart shopper in need wouldn’t stock-up? The rectangular, two-stage Air Filter (Briggs & Stratton part #794422) fits my Intek 18 HP engine perfectly, as does the genuine Briggs & Stratton spin-on Oil Filter (#492932). The included Spark Plug (B&S #491055T) was changed-out during last summer’s maintenance, which included carburetor replacement. Although my particular 18 HP application netted a home-run, be sure to run the model number on your Intek engine to assure compatibility with the parts included in this tune-up kit. How accommodating of Craftsman to include a 48-oz. jug of SAE 30 engine oil. Unfortunately, my 18 HP Intek engine has a 56-ounce crankcase capacity. No big deal, but why not include two quarts of oil to cover all capacities for the engine sizes listed in the product title? While on the subject of product title, my kit-in-hand (#7133136) states that it “fits 14-19 HP single-cylinder Intek engines”, while the kit listed currently under the same number at Craftsman.com states compatibility with identical “14-20 HP engines” – a minor title adjustment, but again, due to periodic manufacturer’s updates, you should always run the numbers to assure the proper fit of all included items. Craftsman offers similar tune-up kits for additional Briggs & Stratton engines, including Quattro, Quantum and Intek Twin. This inexpensive air compressor can be a lifesaver and I recommend everyone keep one in their car. The next time one of your tires is low it’ll get you out of a jam. It’s got a simple female schraeder-value air nozzle on one end (the kind you need to inflate a car tire or most bicycle tires), and a 12-volt car cigarette-lighter power adapter on the other. There’s a good 8 feet or so of electrical cable too, enough to allow you to reach all 4 wheels on your car. Having one of these in the trunk is much better than stopping at a gas station and putting a quarter into their machine for 30 seconds of air. For one thing, you can use it at home or on the side of the road as needed. For another, you’ll have it at home for inflating things like bicycle innertubes and basketballs. It comes with a universal adapter for the nozzle, which basically means a long, narrow cone. You should be able to use this cone to inflate air mattresses or beach balls of various sizes. Just insert the cone until it stops and you should have a moderately good seal. The compressor puts out 150PSI of pressure, which is plenty for a car or a bike. Usually a passenger car wants around 30 PSI and a bicycle tire wants around 60PSI so you’ve got plenty to spare. My only complaint is the operation of the nozzle could be better. You fit the nozzle over the valve you want to inflate and then turn down a lever to lock it in place. This lever is short and really hard to turn. It generally takes both of my hands to do it, especially in tight spaces like between the spokes of a bike. Sometimes using both hands to turn this lever means I lose my grip on the nozzle itself, which may come apart from the valve or just bleed some air from it. It’s a problem going on and coming off. But overall it’s a minor thing and I’ve gotten used to it. It doesn’t interfere with the basic functionality of the compressor, which works well. A nice feature is that the compressor has a built-in compartment for bundling up the nozzle and cable. Just wrap ‘em up and place them inside this compartment, close the lid, and you’ve got a small black box with a handle on it – nothing dangling around. The unit is about the size of a box of Wheat Thins. It fits under the driver’s seat in both of my vehicles so it’s not even taking up trunk space. When my truck was burglarized last year, they stole my compressor out of it. Jerks. I went and bought the exact same one a second time. I think that should show how much I like it. And you really can’t beat the price. Pros: Price. Fitted with an Oregon bar and chain. Extra chain included. Automatic bar oiling. Two-year warranty. Adequate Operator’s Manual. Cons: China built. Stiff trigger action. No installed chain-sharpening feature. Bar and chain excluded from warranty. It was a sad day when my Remington 14” Powercutter electric chainsaw would cut no more. After more than a dozen years of reliable service, the trigger had begun to work intermittently. I was amazed to find that the part was still available – and downright floored to discover the price of such a repair. The Remington was perfectly suited to its assigned duties. Remotely, I would use my 40-volt cordless Oregon chainsaw to cut firewood on the property – which is mostly standing-dead and winter kill hardwood. After lugging said wood back to the house, the plug-in Remington was used to trim and cut to a manageable length. With firewood foraging dependent upon the weather, my late-autumn need for a replacement saw was looming. While in town for supplies, I stopped at the local Sears Hometown store to check available inventory. Most of their chainsaw stock was of the cordless variety. With the introduction of the Lithium-ion battery, it seems there’s not as much of a market for the dedicated plug-in electric saw. But they did have one in-stock – and it was on sale. The Craftsman 16-inch Electric Chainsaw (model 34119) was contained within a cardboard carton that resembled a dining room chair. In its loud red box, it managed to be both funny to look at and awkward to carry. Its 12 amp / 3.5 peak horsepower motor nearly doubled the available power of the Remington it replaced. Completely assembled out of the box, the first task was to add oil to the reservoir that automatically feeds the bar oiler. Unlike my Oregon‘s specialty oil, standard bar and chain oil is all you need with the Craftsman. Chain tension is adjusted by means of a large dial located at the base of the bar. The folks at Craftsman have dealt with the popular chain-sharpening option by neglecting to install one. The Remington was the perfect saw for its purpose. A fine balance of horsepower, weight and 14” bar length made it appropriately light and nimble for extended sawing sessions. The Craftsman is heavier and noisier, with a pronounced “snap” to the chain brake upon release of the trigger. The trigger itself has a somewhat clunky, hard-plastic resistance that requires a more precise index-finger effort – not compatible with an operator’s often-gloved hand. Bar and chain removal and adjustment require no tools, so therefore are easier on the Craftsman. After four months of ownership, it has yet to leak oil from the reservoir – a common problem with both gas and electric models from a variety of manufacturers. The lack of a sharpening option is somewhat compensated by the inclusion of an Oregon replacement chain, which retails in the neighborhood of $14.00 (all prices US). Though reliability has yet to be determined, the Craftsman 16” Electric Chainsaw is shaping-up as a good choice. Seeing its $79.00 price tag chopped-down to $37.00 through Rewards Points incentives, I feel the overall risk is minimal – it would have cost more to repair the Remington. With the extra chain inclusion, the Craftsman becomes a best buy for the sharp consumer in need of its plug-in simplicity and convenience. Though a victim of dated technology, the corded electric chainsaw will always serve a purpose in the rural marketplace. Model variety and availability may have lessened, but so have the prices. For those in need of a conventional electric chainsaw, the Craftsman model 34119, with its 2-year limited warranty, deserves due consideration. Purdy Professional Brush Set: Best Buy Or Brush-Off? Pros: Top quality. Long life. American made. Excellent weight and balance. Cons: Angular trim bristle style too specialized. Some painters prefer natural bristle. Proper post-paint maintenance is essential. Like members of any profession, painters have a preference for the tools they use. Just as the chef has a favorite knife and the carpenter a hammer, painters will discover one particular brush that works perfectly. Often, a brush will possess all the factors that improve speed and accuracy – including bristle length, a comfortable grip and proper balance. When you find “the one” – it works and feels like an extension of your hand. In years past, natural boar-bristle brushes were used primarily for oil-based paints, stains and polyurethane coatings. Their finer bristles allowed the applied product less effort to “level” or settle to a smooth surface before the drying process began. Plus, the natural bristle was impervious to the chemical deterioration that the synthetics often suffered. The synthetic bristle brushes available currently have a finer, more durable bristle that makes them suitable for both latex and oil-based paints. Purdy uses “a blend of DuPont solid, round and tapered Tynex and Orel filaments” in their XL line. Contained within are a 1-inch Dale, a 1-1/2 inch Glide and a 2-inch Sprig. All three are from Purdy‘s “most versatile” XL series and are appropriate for use with all paints. The 1” XL Dale has an angular trim brush style with a copper ferrule and a rat-tail handle. Back in the day, any brush with an angular cut was referred to as a “sash” brush. Aside from the occasional tight access – such as an inside corner obscured by door trim, I never had much use for this size or style – aside from painting sash. With the increasing popularity of metal and vinyl-clad energy-efficient windows, paintable sash is becoming much less common. The 1-1/2” XL Glide has the same angular bristle trim and copper ferrule as the Dale, but features a fluted handle. The Glide’s increased width makes this a more practical choice for cutting-in or detail work in tight spaces. The 2” XL Sprig has a copper ferrule, flat trim brush style and a beaver-tail handle. This has always been my brush of choice – the only non-angular style of the bunch has a comfortable, balanced feel for the majority of painting situations I encounter. Its 2” width allows it to hold the perfect amount of paint for speed, accuracy and desired result. At a time when many of our consumer goods are produced off-shore, Purdy brushes are American-made. Each brush is “signed” by the brushmaker who hand-crafted it – indicated by a small yellow sticker attached to the ferrule. I received this brush set as a door prize at a contractor’s event. Due to the style preference issues stated above, I would not have purchased this combo as configured. However, if Purdy were to replace the 1” Dale with a 1-1/2” Sprig, this would be a best buy. From an economic perspective, this set is still a bargain when considering individual list price. If maintained properly, Purdy brushes will last for years. It was not a common occurrence when a favorite brush would simply wear-out from repeated daily use. The best way to guarantee a long life is to clean your brushes promptly and thoroughly at the conclusion of the job. Hang to store, using the hole in the handle. Pros: Reasonable price. Strong, yet flexible. Polymer reinforced aluminum facing allows for sustained UV exposure. Cuts easily to size using razor or shears. Cons: Powerful adhesive can make placement a one-shot deal. Disposal of protective backing requires a trash can be at-hand. Owning your own home means never being able to say you’re finished. Projects, both routine and unforeseen, occupy your non-working hours – and can often disrupt your dreams. The roof on my former home had a mystery leak that only occurred under certain conditions. A parade of experts never did discover where the water was coming in. Perhaps if I had known then about Peel & Seal Aluminum Instant Waterproof Repair, that mystery could have been history. Like most home improvement ideas, my latest plan was ambitious. Making my home’s principal deck as waterproof as possible would prevent the likelihood of a future re-build costing thousands. The original builder did an excellent job with the structural elements. My mission was to prevent nature’s elements from undermining that accomplishment. Since the deck in question serves the 3rd level of my 4-level home, I could safely remove five rows of the 6-inch-wide decking at a time. I applied a coat of Benjamin Moore Translucent Exterior Finish to the exposed joists, then, when thoroughly dry, placed a strip of Peel & Seal on top of each joist with a quarter-inch overhang to act as a drip-edge on either side. The theory being that when the newly finished decking was reattached using stainless steel screws, the aluminum-faced Peel & Seal would keep the top of the joists totally dry, while diverting moisture away from their sides. Each roll of Peel & Seal Instant Waterproof Repair contains a flexible adhesive layer of rubberized asphalt, bonded with a polymer reinforced aluminum facing, that measures 6 inches wide by 25 feet long. The fact that a 2 x 8 inch joist is approximately 1-1/2 inches thick accounts for my ability to cut each 6-inch width into three, 2-inch strips – allowing for the aforementioned quarter-inch overhang – while avoiding waste. Since each section of decking removed covered 30 inches of joist, placing the strips was quick and simple. To begin, I removed the protective paper to expose the powerful adhesive. I then held the strip at either end, maintaining tension during application so as to achieve a flat, wrinkle-free finish that was centered along the joist’s top edge. Each piece of decking was given a code as it was removed – allowing for its exact replacement and re-use of the original screw holes. Peel & Seal also provided a means to augment the original aluminum flashing directly above where the deck joists meet the ledger board. By removing the apron trim below the sliders, I was able to fine-tune the weatherproofing efficiency of this vital and potentially problematic connection – as well as to further inhibit airflow. When completed, my deck was not only more attractive, but it could now, in harmony with my new red metal roof, laugh at the northern New England elements. The polymer reinforced aluminum facing of the Peel & Seal that is visible between the decking coordinates beautifully with the thousand-or-so new stainless steel screws that secure it to the joists. 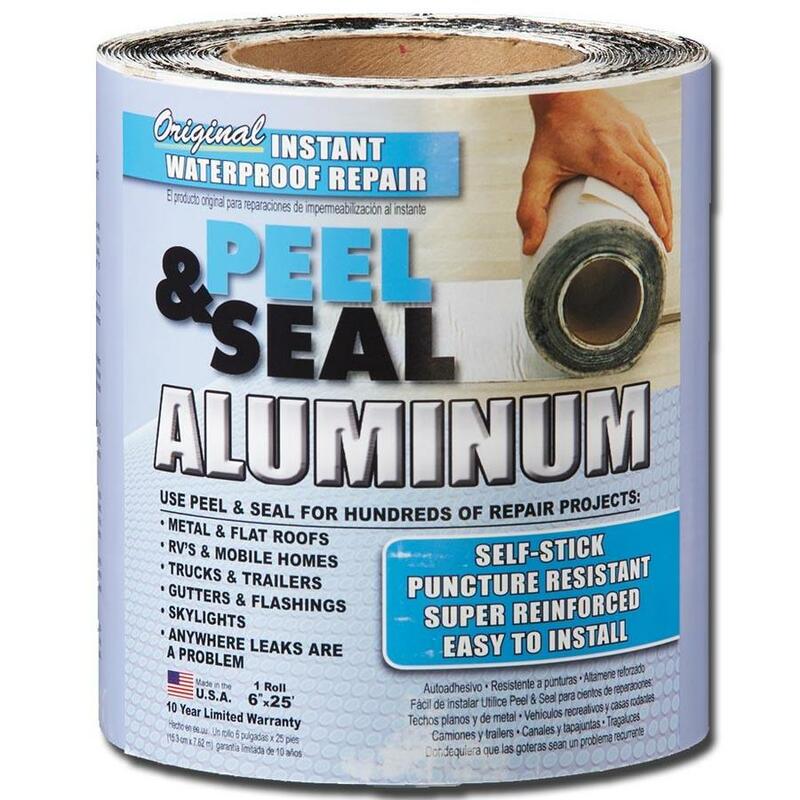 According to the label, Peel & Seal Aluminum Original Instant Waterproof Repair is puncture resistant and can be used “anywhere leaks are a problem”. Potential users should be aware that this product is incompatible with EPDM [ethylene propylene diene monomer], TPO [thermoplastic polyolefin], flexible PVC [polyvinyl chloride], uncured neoprene and silicone caulks. The manufacturer provides Peel & Seal with a 10-year limited warranty. Pros: Prevents creosote build-up. Easy to use. Most effective brand on the market. Cons: Can be hard to find at brick-and-mortar stores. Contains Cupric Acid – keep out of reach of children. When I was a kid, Christmas dinner was an inclusive family tradition in our home. It was always great to have the New York gang arrive to spend time with our band of country-bumpkins. One particular year stands-out in my fledgling yuletide memory – seeing my Uncle Alphonse stuffing a schnauzer-sized ball of used gift wrap into the crackling fireplace. The ensuing roar of the chimney on fire was eclipsed only by the sheer panic and subsequent mortification of my mother’s city-slicker sibling. What Al hadn’t realized was that this was often a yearly occurrence. Being in the firewood business, we used the fireplace daily for its ambiance and supplemental warmth. Before the advent of products such as Meeco’s Red Devil Creosote Destroyer, there was little the homeowner could do to further enhance a chimney’s annual cleaning. Meeco’s Red Devil Creosote Destroyer appears as a fine-to-semi-granular gray powder. When applied to an active bed of coals, its chemical makeup acts as a catalyst to weaken the inherent structure of creosote molecules – thus disabling their adhesive properties within the flow of affected exhaust gasses. The part of the flue that extends beyond the roof-line is particularly susceptible to creosote build-up, as these colder environs encourage condensation of the moisture-laden, non-combusted gasses – even when burning thoroughly seasoned wood. My airtight wood stove gets a comprehensive monthly cleaning during the heating season. When used according to package direction, the stovepipe contains a fluffy, light-gray ash that brushes away completely with little effort – leaving bare metal in its wake. Should I get lazy with the schedule or run out of product, the inner walls of the pipe will display a hard layer of black, glossy buildup that can only be partially removed with 60-grit sandpaper. Under the proper conditions, this licorice-like accumulation is quite flammable, as my Uncle Al discovered to his horror some years ago. The package directions advise the user to “Sprinkle two tablespoons over a medium fire. Use with every third fire.” Though beneficial toward maintaining a cleaner, safer flue, no creosote neutralizing product can replace periodic professional cleanings. It is important to remember to have your chimney cleaned and inspected on an annual basis. Meeco’s Red Devil Creosote Destroyer is available in a variety of sizes, including 1, 2 and 5-pound plastic containers. In my experience, the 2-lb. container will provide a season’s-worth of product for one appliance, when used as directed. The Red Devil line also includes a version suitable for fireplaces and non-airtight applications. Contains Cupric Chloride – always keep container tightly closed and store in a dry place, out of the reach of children. Pros: Price. Quality. Solid investment. Sold by quantity vs. weight. Professional, classy look. When the time came to live where I desired, my search was limited to well-built homes of recent construction. Living through the coldest winter in recent memory finds me grateful for the efforts of those who designed and assembled such a strong and comfortable dwelling. No expense was spared with the passive solar design and heated, suspended concrete floors. The only exception was the choice of fasteners used to construct the 10 x 26 ft. deck that spans the width of the Chalet-style facade. One of last summer’s projects was to prolong the life of the deck. For reasons unknown, the 2-1/2 inch Phillips-head screws that fastened the decking were neither exterior nor galvanized. As a result, rust had set-in, which had bonded the screws to the boards – weakening their structure and making them difficult to remove. The solution was to take-up all 520-odd board feet of decking. While disassembled, I tung-oiled every surface – as well as the 2 x 8 inch floor joists, beneath. An Internet search revealed few affordable options for a stainless steel replacement. The local Big-Box hardware sold the #10 x 2-1/2 inch square drive deck screws by the pound – some of which I had in inventory. When I went to buy more, the square drives had been replaced by star drives. Being a creature of consistency, such an underfoot mismatch just wouldn’t do. The Amazon.com search engine is good, but not without its quirks. Hiding beneath a cyber-rock was the listing for Raw Products Square Drive Deck Screw, Type 17 Point 305 Stainless Steel #10 x 2-1/2. Sold in quantities of 250 for $27.26 (US), their price was significantly lower than the same quantity, sold by the pound, that I had purchased at the start of the job. The decking would require over a thousand replacement screws – over half of which had already been installed. Another 500 would definitely wrap it up. The screws arrived sealed in heavy plastic within a cardboard box. For convenience, I counted them out and boxed them in quantities of 100 – there were exactly 500 screws enclosed. In comparison to the screws I already had, they were identical. Their clean, precision threads and the deep, square inset of the head made installation quick and secure – and their presentation nothing short of elegant – in accord with the deck’s natural finish. Due to the corrosion of the original screws, a few failed to remove completely without breakage. The Raw Products Stainless Screws were strong enough to bypass the occasional remnant while being driven-home, without bending or displaying their bugle-flat head at an odd angle. According to their parent website, fasteners of all description can be purchased by the piece, or in quantities of 25, 100, 250 or 1000. For more information, use the link below and click-on “Deck Screws” under “Fasteners” in the upper-left side-bar. With my deck maintenance marathon behind me, I look out tonight and see the stainless steel fasteners, gleaming like jewels by the light of the moon – the successful conclusion to a labor of love, on display. If I had discovered Raw Products at the start of the project, I’d have saved more than $50.00. What could be more beautiful than that? Pros: Fast drying. Easy to use. Improved trigger design. True nickel-stainless finish. Cons: Contains Butyl Acetate – vapors harmful and flammable. In my painting career, I was called-upon to accomplish a variety of projects. Few were more difficult to estimate than a kitchen re-paint. The extent of factors such as wear and condition – and the prep-quality of previous coats – can be tough to determine until work begins. A recent project involved custom cabinetry installed around 1975. The quality work featured raised-panel doors suspended from surface-mounted “H” hinges – a tribute to its bicentennial origins. The previous paint was a stark-white, showing thin in spots. The client expressed her desire to go off-white with a nickel hinge to match the stainless steel appliances. The decision to reuse the hardware was unanimous – updating the colonial theme using a satin off-white latex with subtle pewter tones (White Dove from Benjamin Moore) and a Rust-Oleum Satin Nickel repaint for the flat-black hinges. After removing the doors and hardware, the hinges were soaked in solvent, then wire-brushed to remove any old paint and soil – revealing anew their lightly hammered texture. Once washed with soapy water and thoroughly dried, I laid them out on cardboard. On a separate cardboard, I popped the screws through so they were separate and upright. Since Rust-Oleum dries quickly, the directions recommend the application of several light coats a few minutes apart, rather than one or two heavy coats. Working quickly with brisk, sweeping strokes, I applied a total of seven coats overall – at which point the hardware had the silver-nickel sheen the label had promised. Reconstructing a project is always a satisfying experience. The satin nickel hardware provided a perfect complement to the cabinet color. The colonial elements were, in effect, modernized without compromise to the period décor – at a minimal expense. I’ve used a number of colors in the Rust-Oleum Universal Metallic palette. All provide exceptional results for both interior and exterior applications. For best results, shake the can vigorously for at least one minute, then shake briefly between sprays. Keep the can moving during application to assure an even coating. Short, rapid, quick-trigger hits will avoid excess accumulation. Due to the potentially toxic and volatile ingredients contained within, always use Rust-Oleum Universal All-Surface Paint in a well-ventilated area. This job occurred in early June, so I was able to set-up outside on a covered deck – staying up-wind of the target as the paint was applied. The latest generation of sprayer used with the Universal Metallic line features a tapered neck grip with a trigger-action spray tip – a design superior to the cumbersome top-button cans of yore. This improvement eliminates the tendency for over-spray to color the tip of one’s index finger. Even in consideration of such an advance, the use of rubber gloves is recommended where an ingredient such as Butyl Acetate is involved. When used within the parameters of proper technique and surface-prep, Rust-Oleum Universal Satin Nickel Metallic is a quality option when updating the details of your own designer inspiration. The manufacturer has constructed an attractive, informative website which provides tips and techniques for obtaining the optimal benefit from their products. Go to and start painting with confidence. Pros: Rolls on easy, decent paint blocking capability. For years, we used 3m Scotch Blue Original Painter’s Tape on nearly every paint project assuming it was basically the only product anyone would consider using… that is until we discovered Frog Tape Green Pro Painter’s Tape with Paint Block. The 3M product always offered us a decent final result so it never occurred to us to give another brand painter’s tape a shot. I suppose, by making a comparison of the two products you as a reader may come to realize why we made a switch. The first thing one might want to consider is the overall quality of the tape, how well it rolls off the spool and adheres to surfaces. When I consider these qualities, I never really noticed much of a difference no matter which product I happened to use. The overall quality of thickness and strength were very similar in my opinion. Each came off the spool easily and is tough enough not to tear irregularly yet still cuts where desired. As far as I can tell, there is no substantial difference in the adhesion quality of both the 3M blue and green Frog Tape. On those instances where you may not set the tape as you desired on the first attempt, each will lift off the wood, glass or drywall quickly and easily and remain sticky enough to reattach to the surface and still effectively block paint splatter or over-brushing. Sticking to glass, drywall or wood molding was not an issue for either tape. When it comes to the tape itself, I can’t distinguish and difference beside the fact the other is green and the manufacturer decided to make this one in blue. Even though we always found ourselves using this tape for our paint projects, it took trying a somewhat better option to make the limitations of the product evident. The paint blocking quality of this 3M tape was “about as good as one would expect”. Most of the brushed or rolled paint did end up on the tape. Bleed-through or paint getting under the tape was, for the most part, only a small issue. We followed up and cleaned leaked paint off moldings when it did bleed through. Once we had the opportunity to witness the result left by the Frog Tape we were pretty much sold on it as our new choice. We now witness sharper lines and virtually no bleed through so we no longer feel that 3m Scotch Blue Original Painter’s Tape offers us as much protection as we could possibly get. I might point out that 3M appears to have tried to counter the competition with a newer product which we have never tried. 3M is now selling their painter’s tape with Edge Lock which may actually be the answer to the Frog Tape I compare to. The problem with this new improved 3M tape is that it’s sold at a premium price above what we pay for the competition. Finally, when it comes to removing the tape we also noticed a difference in performance. If the paint dried too quickly we would find the 3m blue tape reviewed here would tear more easily. Plenty of times we would find a small sliver of tape left that had to be cut off with a blade… especially on wood moldings. We didn’t find the same perplexing trouble that caused plenty of extra time and hassle during clean-up with the green competitor’s tape I reviewed several days ago. Again, the 3M product did not perform up to the competition in respect to removal. For about a buck to a buck and a quarter extra per roll, you can pick up the improved variety of this tape that should offer about as much as the green tape we are now using… but why? This 3m Scotch Blue Original Painter’s Tape actually ends up costing just about the same as our new tape of choice. This product does offer a decent result but considering it does not live up to its competition I can only offer three Veryhelpful.net stars and after years of being a believer it makes me feel blue to take a pass on a “BUY” recommendation.